It's been a few weeks since I gave you guys a closet update - After my inventory and initial purge, I've been trying to get my remaining garments in order and promised I'd show you some of my organizing techniques. 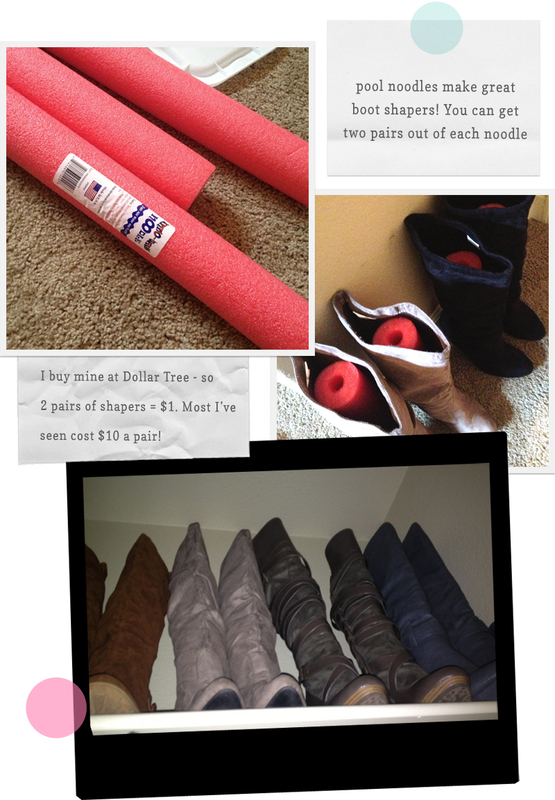 Turns out, taking photos in your closet isn't the easiest task, so hopefully you can get the gist from these I took with my phone. Everything in my closet has it's place - Tops are hung together in color order, skirts are hung together in color order, dresses together, blazers together, cardis together, pants together - all in color order. I think the quickest way to achieve an organized look in a closet is to use the same hangers, so I've been slowly converting all of my hangers to the same black slimline hangers. I use bins to store things like workout clothes, camisoles, scarves, and bras. We don't currently have a dresser, and it's nice to have everything in the same place. We have some great shelves and cubbies in our closet that I utilize to fold sweaters, t-shirts, and jeans. I used to store shoes in them because they looked pretty and made me happy, but it wasn't really the best use of space. Purses go on the top shelf - I found these magazine racks at Garden ridge to help hold the slouchy purses, and stuff the more structured bags with homemade "purse pillows" to help them hold their shape (and stand up better). 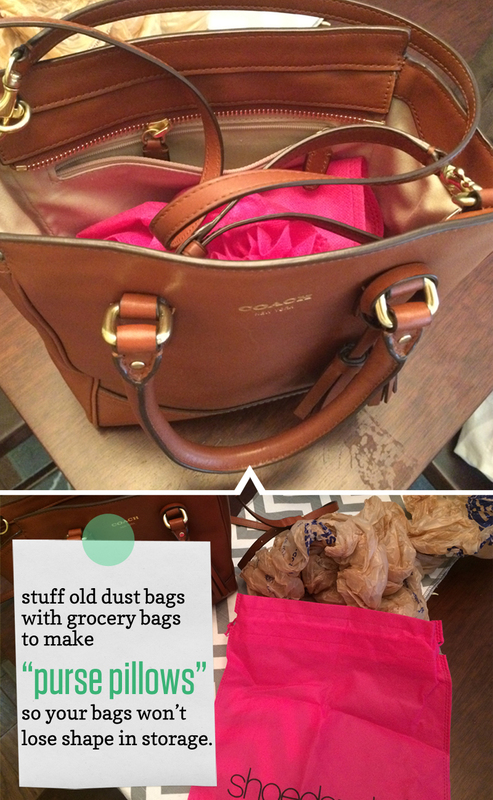 Out of season bags go in their dust bags. So what happened to the shoes, if I'm not storing them in my master closet any longer? Well, we're lucky enough to have a third bedroom that doesn't get much use, so I decided to use that closet as my shoe closet. Having a shoe closet or shoe room isn't exactly normal, per say, but since I pretend my shoes are a "collection" I'm also pretending having a shoe room is okay. I have many shoe enthusiast friends who have also converted spare bedrooms into shoe rooms, so at least I know some people get me ;) Realistically, if we were to start a family or downsize our home, I'd have to seriously rethink my shoe habits, but for now, I'm just enjoying them. 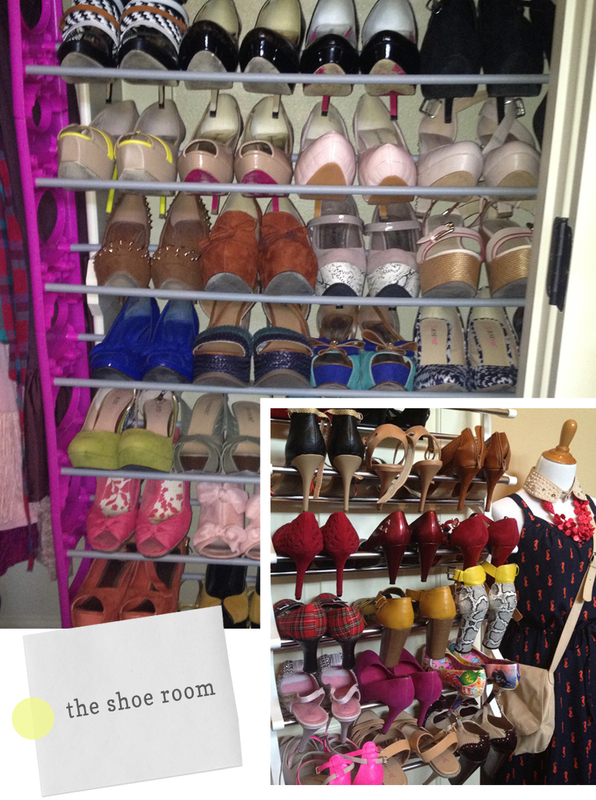 The shoe room still needs a lot of work, but here's a sneak peek. So that's my closet! One of the biggest things you have to do when you have a large amount of THINGS is to make sure they're organized. I do my best to keep order so my wardrobe doesn't feel overwhelming. However, the past few weeks I've decided I STILL have too much and need to continue purging. 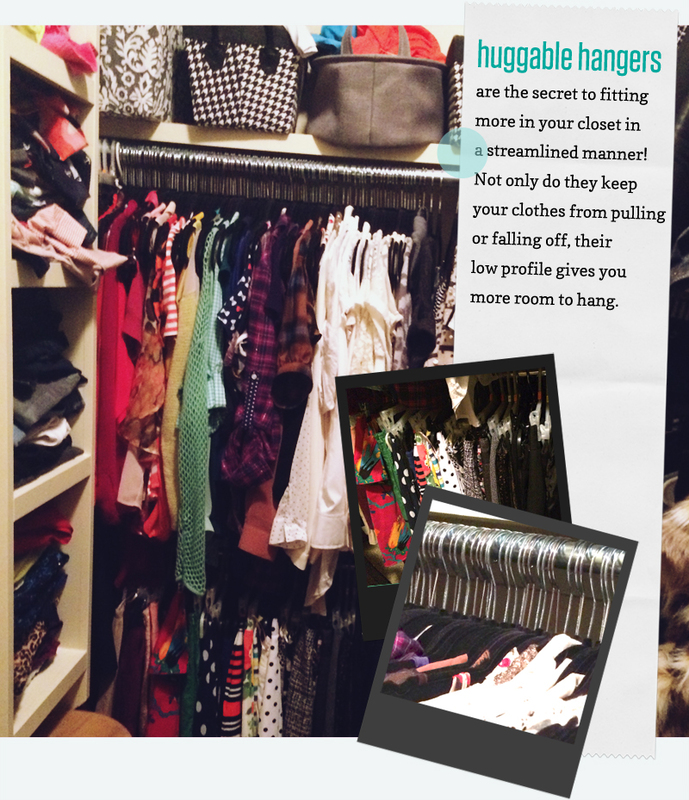 I'm considering doing an experiment where I pretty much only use what I can hang on my huggable hangers this fall and see if I go looking for the pieces that don't make the cut. Anyway, thanks for dropping by for the tour! If you have any questions, I'll be happy to answer them. How do you guys get your organization on? ?